I'm pretty sure Canasta is a game of some kind. A combination of cricket and badminton, I'm guessing. Or croquet and ice dancing. Soccer and curling? Well, whatever... I doubt it's anything that any self-respecting American would ever be caught dead doing. Leave it to the Limeys, Kiwis, and Canucks. There is, however, a very American version of CANASTA. That would be the six-member band from Chicago. 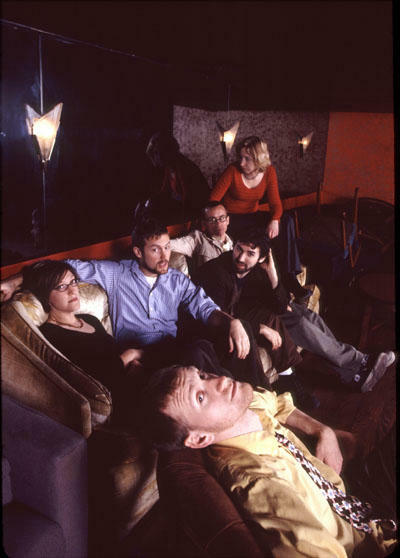 Formed in 2002, they are as follows: BRENDAN BYRNES (guitar, vocals), JOHN CUNNINGHAM (keyboard, clarinet, vocals), ELIZABETH LINDAU (vocals, violin), MEGAN O'CONNOR (piano, vocals), MATT PRIEST (vocals, bass, trombone, percussion), and COLIN SHEAFF (drums, vocals). Clarinet? Trombone? Sounds a bit off-kilter, no? Well... "eclectic," maybe. And obviously "ambitious" when it comes instrumentation and arrangements. But, for the most part, these folks are playing a recognizable and inviting brand of indie pop/rock -- or "ultra-melodic, orchestral pop," as they would have it. Indeed, some creative touchstones here would have to include THE DELGADOS, YO LA TENGO, BELLE AND SEBASTIAN, and -- perhaps most of all -- the magpie methods of THE NEW PORNOGRAPHERS. The band released their first full-length, WE WERE SET UP, in 2005. Not surprisingly, a few more "eccentric"
instruments were brought to the party. Trumpet. Upright bass. Cello. Pedal-steel guitar. Again, though, these tools are integrated into the mix in a smart and subtle manner, and the album's 13 songs never feel cluttered or convoluted. Indeed, the fugue-like organ on "Microphone Song" only helps to add a hefty sense of menace, while the squiggly synthesizer line on "Sympathetic Vibrations" serves to heighten the playfulness of the "Peanuts Theme" piano and boy/girl call-and-response vocals. WE WERE SET UP can be purchased from CD BABY, eMUSIC, INSOUND, iTUNES, or directly from the band's WEBSITE. 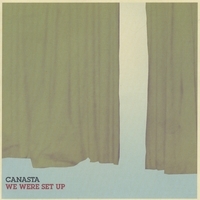 CANASTA will be playing Schubas in Chicago on February 22 with ANNUALS and THE NEVER and the Empty Bottle on April 17 with AQUEDUCT. Keep an eye on their MySPACE page for more music and live performances. [MP3] Annuals/"The Bull and the Goat"
Actually, Canasta is some kind of card game.